Along with his co-hosts in the The Grawlix comedy troupe, Adam created, writes and stars in truTV’s Those Who Can’t, in which Adam plays Spanish teacher and bon vivant Loren Payton. He has appeared on Conan, Comedy Central Presents, The Meltdown with Jonah and Kumail, Happy Endings, Deadbeat, Flophouse, Hidden America, and @midnight. He was also featured on the Nerdist, Comedy Bang Bang, and Sklarbro County podcasts. Cayton-Holland has performed at the Montreal Just For Laughs, SXSW, Bridgetown Comedy festivals, and helms his own comedy extravaganza in Denver, The High Plains Comedy Festival. He has also performed at The Kennedy Center and Carnegie Hall. 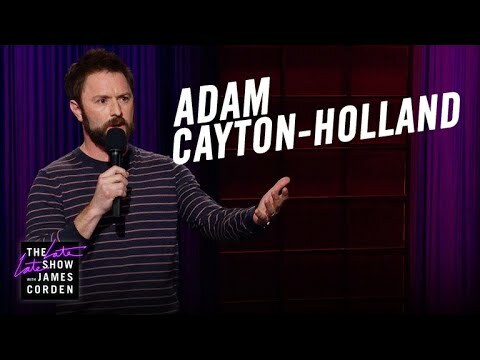 Adam has three albums, I Don’t Know If I Happy, Backyards, and Adam Cayton-Holland Performs His Signature Bits, all available on iTunes. His first book, Tragedy Plus Time, was recently released by Touchstone Books and is available in bookstores everywhere.